2 Pond Farm Barns is a stunning period barn conversion which has been tastefully renovated and refurbished for use as their family holiday second home. It has a fabulous open plan kitchen and living room (47' long) which has a high vaulted beamed ceiling and exposed flint walls, with French doors opening out to the attractive south facing walled garden. The barn is perfect for families sharing with 2 downstairs bedrooms and 2 bathrooms, with a further 2 bedrooms and a cloakroom upstairs. It is conveniently located opposite a lovely duck pond, only a short walk away from the excellent Kings Head hotel, a village shop and children's playground. The beautiful sandy beaches at Brancaster, Thornham and Holkham, plus the delightful shops in Burnham Market, may be reached within 15 minutes drive. Please note this property has a strict no pets policy. Entrance hall with a stone floor and underfloor heating. There is a cupboard housing the washing machine and tumble dryer, plus a cupboard for coats and boots. From the hall way it leads through to the stunning open plan kitchen, dining and sitting room, which is 47' long and has the kitchen at one end, a dining area in the middle and a comfortable sitting area with a wood-burning stove at the other end. 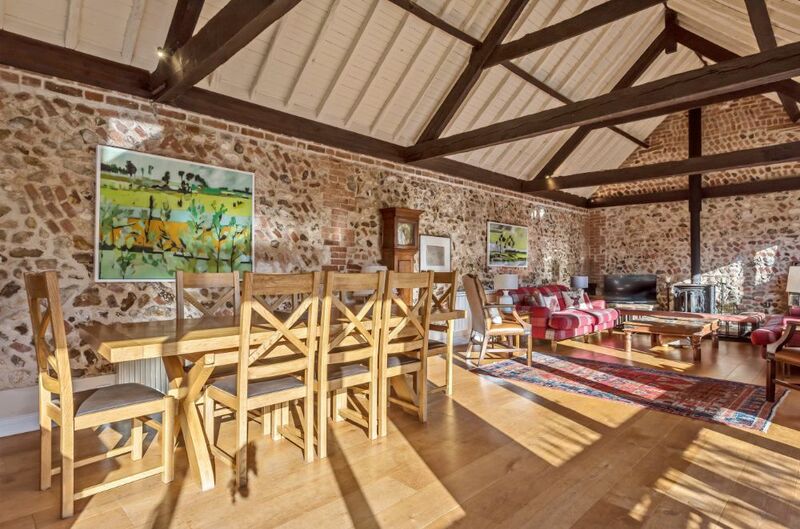 This really does have the "wow factor" with its vaulted ceiling with exposed rafters, the original exposed flint walls and the fully glazed wall overloooking the south facing walled garden. There is the advantage of wi-fi throughout the barn. Kitchen: a hand-built kitchen with a range of kitchen units and granite work surfaces. It has been equipped with high quality crockery, glassware and saucepans. There is an electric oven with halogen hob, a microwave, a fridge/freezer and a dishwasher. There are 2 stools under the granite breakfast bar, with power points handy for using a lap top. In the centre of the room is a large oak dining table with 8 chairs. Sitting area: has a wood-burning stove at the far end with an attractive fender. There are 2 comfortable sofas, 2 armchairs and a flat screen freeview digital TV with DVD player. There are French doors which open onto the private walled garden. Master bedroom suite: off the entrance hall is an ante-room with a sofa which is ideal for a baby to sleep in, or a quiet space to escape to! The master bedroom is a lovely room with a high vaulted beamed ceiling and 2 windows overlooking the walled garden. It has a king-sized bed, bedside tables and lamps, a wardrobe and a bureau, chest of drawers. Bathroom 1: is accessed off the ante-room, adjacent to the master bedroom, and has a bath with shower mixer taps and a shower over, hand basin, WC, a heated towel rail and underfloor heating. Bedroom 2: has a single bed plus full-size sturdy bunk beds, making it ideal for up to 3 children. Bathroom 2: contemporary tiled bathroom has a bath with electric shower over, hand basin, WC, a heated towel rail and underfloor heating. The stairs are not steep and there is a hand rail. On the landing is a built-in wardrobe. Bedroom 3: has a sloped ceiling with exposed beams and a lovely view across the fields. There are twin beds and a chest of drawers. Bedroom 4: has a sloped ceiling with exposed beams and a velux window. There is a double bed and a chest of drawers. Cloakroom: with a hand basin and WC. Please note that all the mattresses, towels, bed linen, pillows and duvets are all of a high quality. Access to the barn is via a shingled drive almost opposite the attractive duck pond in Bircham Tofts. At the end of the drive there is a garage and parking space for 2 cars. The barn has an attractive south-facing walled garden which is lawned, with a paved terrace area and well-maintained borders with shrubs and flowers. There is outside furniture and a barbecue. The house is opposite a lovely pond and there are good walking tracks in both directions from the house - one of which leads to the Kings Head (excellent pub/hotel serving delicious food), village shop and childrens' playground. There's also access to the Peddars Way and many other local walks. The beautiful coast at Brancaster, Holkham or Thornham, plus the delightful shops in Burnham Market, are within 15 minutes drive away. It is close to the royal Sandringham Estate and just 4 miles from Anmer where the new holiday house of Prince William & Kate!